In recent years with my busy schedule, I rarely have the time to make homemade cosmetics. This was one of the reasons I developed my own facial cosmetics line. But for those of you who are interested in creating your own cosmetics, these are the best recipes that we could find. This idea is as simple as it gets! 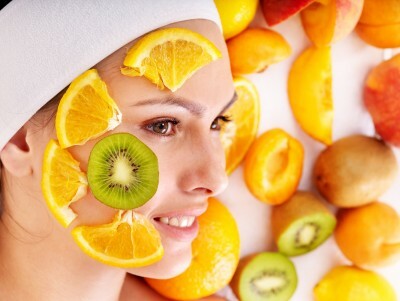 Just like the lady in the picture, you can place pieces of fruit on your face for an easy and effective skin treatment. Regular applications will help moisturize and nourish the skin, improve circulation, provide antioxidant protection, and the fruit acids assist with exfoliation. Besides the pictured fruits, try applying papaya, strawberries and bananas. Melt the coconut oil at a low temperature in a double boiler or any small bowl placed on top of a larger pot of hot water and briskly whisk the aloe pulp, honey and lemon into the coconut oil until all ingredients are thoroughly mixed. Be careful not to burn yourself! When the mixture has cooled, apply a very small amount to your skin and spread evenly over your entire face. Refrigerate the unused portion. Gently warm and whisk again before reuse. While strawberries even out skin pigmentation and help slough off old skin cells, the dulse is high in minerals and can help tonify sagging skin. Mash and whip all ingredients together in a small bowl and apply the resulting masque to the entire face. Wait for 10 minutes and remove the masque with a wet washcloth and lukewarm water. Parsley has the ability to calm sensitive skin while cucumbers are cooling and astringent. Nutritional yeast is wonderfully nourishing for mature skin. Mix ingredients together to the desired consistency and spread over your cleansed face. Allow to remain for 10 minutes and then rinse thoroughly with lukewarm water. Bananas nourish all types of skin, and honey makes this mask even sweeter, but the secret ingredient is the sesame oil. Asian beauties use it to keep their skin radiant. Whisk ingredients together with a fork and apply to clean face. Let it remain on your skin for 10 minutes and remove with a wet washcloth and lukewarm water. Lovely as these products are, you will not be able to store it in a jar and use it later without refrigeration—they are perishable! I suggest making just enough for one application. Even when stored in a refrigerator, they should not be kept for more than two to three days.